Debris flows, fresh concrete, sewage sludges, drilling fluids, paints, ceramic slips, etc, are concentrated suspensions of particles of various sizes in a liquid. As a result of the interactions between the particles these materials exhibit a strongly non-Newtonian behavior. They are generally yield stress fluids because the particles form a structure which needs to be broken before flow can take place. In some cases this structure breakage induces a decrease of the apparent viscosity. If the structure can reform at rest we are dealing with a reversible process, and we are dealing with thixotropic materials. The rheological characterization of such fluids requires to pay a close attention to results obtained from rheometrical tests since various critical artefacts may occur which make the data irrelevant. 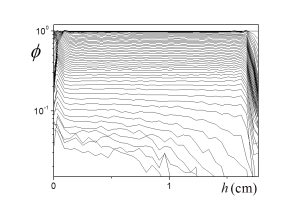 This is for example the case of shear-banding (see Figure 1), which occurs when the imposed shear rate is below a critical value for thixotropic fluids. A useful technique to quantify this effect is Magnetic Resonance Velocimetry (see Figure 1 and 2) through which we can directly observe the shear-bands. 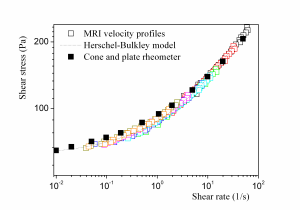 More generally MR Velocimetry in Couette flows provides a technique for determining the local behavior of the material in time, via the correspondence between the local shear stress (deduced from the applied torque and theoretical stress distribution) and the local shear rate (measured) (see Figure 2). 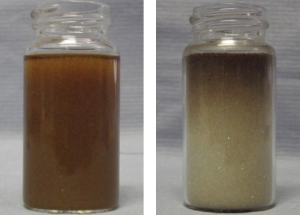 In flowing suspensions sedimentation can also occur, even if the particles were initially well suspended in the material at rest (see Figure 3). The origin of this effect is that, as soon as it starts to flow, a yield stress fluid behaves as a simple liquid, so that the particles submitted to gravity can fall as they would do through a Newtonian liquid (of apparent viscosity equal to that of the flowing yield stress fluid). Yield stress fluids are encountered in a wide range of applications: toothpastes, cements, mortars, foams, muds, mayonnaise, etc. 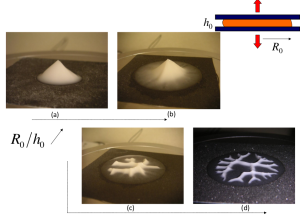 The fundamental character of these fluids is that they are able to flow (i.e., deform indefinitely) only if they are submitted to a stress above some critical value. Otherwise they deform in a finite way like solids. 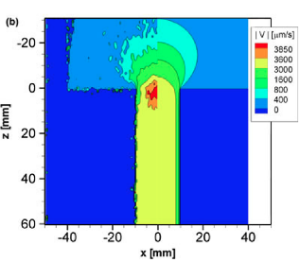 In a steady state simple shear situation, such as in a straight cylindrical conduit, the velocity distribution can easily be predicted: a central (solid) plug surrounded by a sheared (liquid) region along the wall. 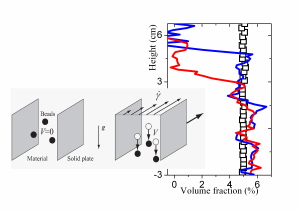 The flow characteristics of such materials under more complex boundary conditions (such as flows around obstacles, spreading, spin-coating, squeeze flow, elongation, dripping (see Figure 4), adhesion test (see Figure 5), surface tension measurement (see Figure 6), etc) are in general difficult to predict as they involve permanent or transient solid and liquid regions that may be hardly located a priori. In addition it may be important to take into account that deformations in the solid regime can play a critical role in transient flows and that the yield character is not apparent in the flow field when the boundary conditions impose large deformations. 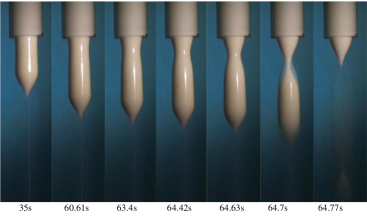 The flow of non-Newtonian fluids through porous media is of interest for various applications: penetration of glue in the surface porosity of solid materials, injection of muds, slurries or cement grouts to reinforce soils, propagation of blood through kidney and, likely the most economically important applications, namely injection of drilling fluids in rocks either for the reinforcement of the wells or for enhancing oil recovery, and hydraulic fracking. We are here dealing with a rather complex field of research as it involves fluids with complex intrinsic rheological behaviour flowing under complex boundary conditions (i.e. the geometrical structure of the porous medium). An even more situation is encountered with two-phase flows. A few examples can illustrate this complexity. When one tries to simulate the flow of a typical yield stress fluid (a Carbopol gel) through a contraction a discrepancy seems to subsist between the numerical predictions and the velocity field measured by MRI (see Figure 7a). 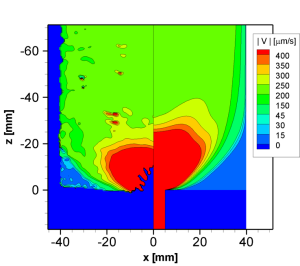 This is likely due to fact that it is difficult with basic simulation tools (here Flow3D) to take into account the effective behaviour of the material in its solid regime and the transition between the solid and the liquid regime, AND to identify experimentally this effective behaviour. As a consequence there may be elastic effects not taken into account in the simulations which might explain this discrepancy. 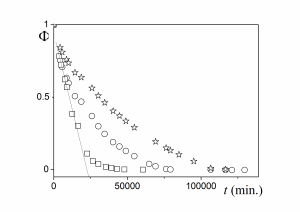 On the contrary, for a yield stress fluid exhibiting almost no elastic effects (here a kaolin paste) it was shown that the discrepancy is almost negligible (see Figure 7b). Surprising effects can also occur. 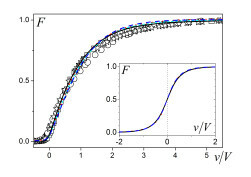 For example the steady flow of a yield stress fluid though a bead packing exhibits a statistical distribution of velocity which is similar to that for a Newtonian fluid (see Figure 8). 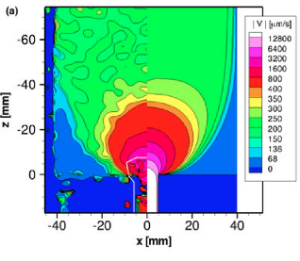 That suggests that the local velocity field is also close to that for a Newtonian fluid. And thus, for the flow through a complex geometry, with a succession of rapid contractions and expansions, a non-Newtonian fluid (the yield stress fluid being a strongly non-Newtonian fluid) loses its non-Newtonian character. 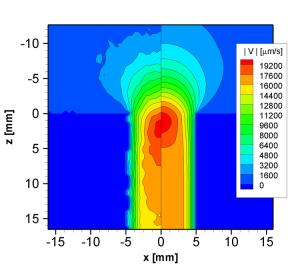 Finally for viscoelastic fluids displacing a Newtonian fluid peculiar effects can also be observed at a local scale. 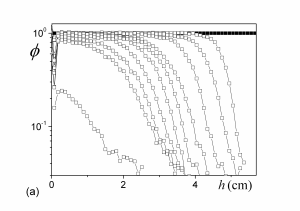 This is illustrated in Figure 9 where we can see that as the elastic effects are increased (by increasing the polymer concentration) the flow characteristics widely vary around the contraction. In paper or food industry and civil engineering, many products need to be dried at some steps of fabrication, i.e. the liquid initially contained in the material (a porous medium) has to be removed. Drying process should be controlled with great care, as it originates huge energy consumption (10% of the total consumption in industry) and it determines final material properties. Especially in civil engineering, depending on the situation two specific challenges should be addressed as follows: how to remove water from the material faster without increasing energy supply, and how to keep a certain volume of water inside the porous medium for longer times. As a first step to understand drying it is useful to consider the ideal situation of a simple bead back initially filled with pure water and submitted to an air flux along its free surface (one of its side). 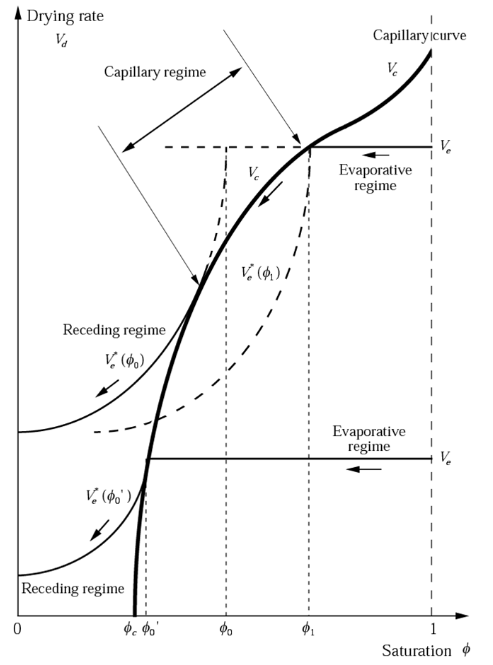 Three characteristic velocities can be usefully distinguished: the rate of evaporation per unit surface imposed by the air flux, Ve, the fluid velocity through the porous medium imposed by some capillary disequilibrium (Laplace pressure due to different meniscus sizes from on extremity of the sample to the other), Vc, and the rate of evaporation due to diffusion through the sample when the first liquid interface is situated at a distance H from the sample free surface, Ve*. As soon as the substance to be evaporated is not a pure liquid drying can lead to more complex processes affecting the drying rate and the structure of the material. The simplest situation is that of suspension of colloidal particles (see Figure 12). During drying the particles may be transported by the liquid as it moves towards the surface as a result of capillary reequilibration process? They then tend to accumulate in this region, leading to a gradient of concentration at the end of drying. Moreover, by accumulating particles in the upper region it creates a dry front, which induces a decrease of the drying rate more rapidly than with pure water. The situation is more complex when the fluid is a paste. When the water moves out of it the paste becomes more concentrated and thus its behavior changes, it becomes more pasty. In some cases, i.e. 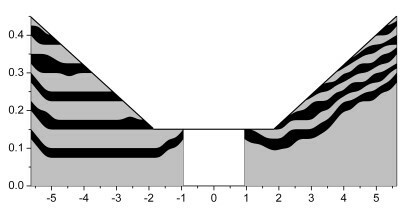 for a kaolin paste (see Figure 13a) the capillary effects remains much larger than the yield stress of the suspension so that the drying characteristics remain quite similar to that for a pure liquid. This is likely so because the kaolin particles suspended in the paste can easily approach each other since the colloidal interactions are negligible. 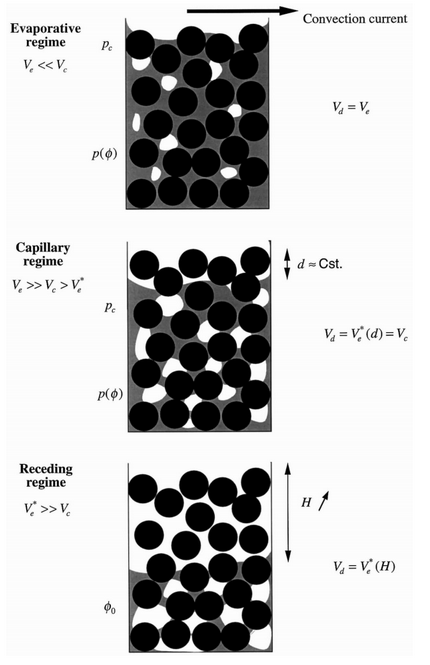 On the contrary, for a Carbopol gel (see Figure 13b) the suspended elements can approach each other only if they are submitted to high forces, likely larger than capillary effects. As a consequence it seems that the gel tends to form a dry region in the upper layer of the sample before being able to reequilibrate the liquid distribution in the sample. Finally the drying rate is much larger (about three times) than for the kaolin paste (see Figure 14), even though they had the same initial yield stress.